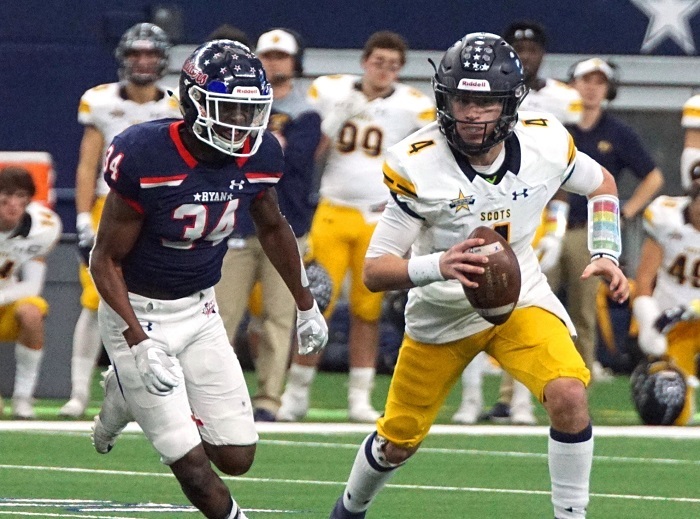 On Sunday, HCS’ Derek Duke Matthew Postins made their way to the Ford Center at the Star (Frisco, TX) where they saw hundreds of prospects display their talents on the field. 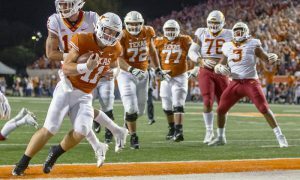 Luckily, they didn’t have to fight any weather indoors and, in the end, they saw some great plays made along with some excellent quotes from prospects with serious interest in Big 12 schools. They watched over 8 hours of drills, one on ones, you name it, but the important thing at the end of the day is, where do schools stand with these talented young men? Here is the best of the best from Sunday afternoon in Dallas. Enjoy! “I haven’t really gone down to Baylor. Last time I went down is when they played Texas. I did like the atmosphere and I did like the uniforms, you can’t miss those uniforms. I haven’t really had time to talk to the coaches or anything like that, but I am still open and looking forward to filling up the open days I do have to talk with coaches and players.” Recruiting nugget: Jai has strong ties with Arkansas and he really had great things to say about the Razorbacks. 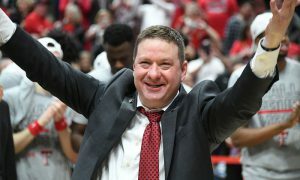 I would say with confidence that he is very much an Arkansas lean at this point and time. I got the chance to speak with Wilson for a few minutes about Texas Tech where he was committed since November of 2018. He committed under the old Tech staff and has not yet been in contact with the new staff even with him trying to contact them himself. Then on Monday, Wilson withdrew his decision from Texas Tech so he can look elsewhere. I’ll say this about Wilson, he was (In my opinion) one of the five best quarterbacks I saw this past Sunday and some school will be lucky to have him on board. It’s a shame that the new Texas Tech staff couldn’t figure something out and get in contact with him. Nathan Anderson, the four-star offensive lineman who plays at Frisco (Texas) Reedy High School, has Big 12 offers from Baylor, TCU and Oklahoma State. The 6-foot-5, 262-pounder would like to make his decision about his future this summer. He had just visited Baylor the weekend before The Opening and said the visit felt “very elite and exclusive.” Anderson also said TCU was attractive because “you know the coaches are going to be there when you leave.” But he had an advantage over some of the other participants in The Opening — The Star in Frisco is one of his home stadiums, since Frisco ISD schools play their varsity games in the facility. The Star is the training facility for the Dallas Cowboys and the indoor field doubles as an indoor high school stadium. Prince Dorbah already has two Texas state championship rings as a member of the Highland Park Scots, located in Dallas, Texas. But the four-star outside linebacker, who comes in at 6-foot-2, 210 pounds, has a healthy number of scholarship offers, including Alabama and Florida. Big 12 schools Baylor, Oklahoma, Oklahoma State and Texas have also made offers, and 247Sports.com’s Crystal Ball has Dorbah going to Texas. 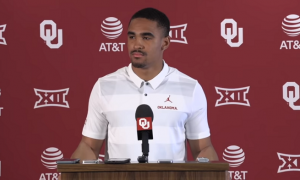 He said he had a good relationship with all four Big 12 schools and that they were among the first schools to offer him, some as early as his sophomore year. 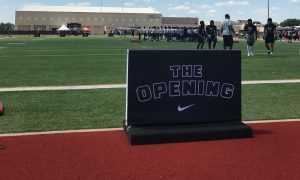 Wide receiver Marvin Mims had a solid day at The Opening and was coming off an appearance in the regional basketball playoffs for his high school, Frisco (Texas) Lone Star. 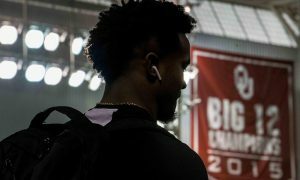 He played games on Friday and Saturday in Fort Worth before heading over to The Opening. He said he never gave a thought to not showing up. The 6-foot-1, 165-pound receiver has Big 12 offers from Baylor, Kansas, Oklahoma, Oklahoma State, TCU and Texas Tech. Mims said he’d like to have a commitment made by the end of the summer. Outside linebacker Brennon Scott was a popular player at The Opening and for good reason. The 6-foot-2, 220-pounder from Bishop Dunne High School in Dallas, Texas, has a plethora of offers, including Big 12 schools Baylor, Kansas, Kansas State, Oklahoma and Texas. 247Sports.com has Scott listed as a four-star recruit and projects Scott as a Texas A&M signee. But he said he intends to visit Texas, Texas A&M and Oklahoma as he tries to make a decision. He might also visit Baylor and Kansas. He made it clear during his conversation with reporters that he likes to blitz and that the schools he’s considering have all talked about how they can utilize him in that capacity. 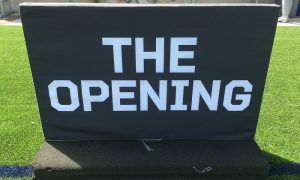 Many players at The Opening had offers from Kansas, and Scott talked about what has him interested in at least considering the Big 12’s doormat program. Wide receiver Lawrence Arnold from DeSoto (Texas) has Big 12 offers from Iowa State and Kansas. The 6-foot-3, 175-pound receiver made some strong catches during his workout at The Opening. The three-star receiver, per 247Sports, said The Opening was the first camp of its type he had participated in. He’s hoping to make at least two visits this spring. “I’m trying to get a visit to Illinois, and I want to line up a visit to Kansas coming up,” Arnold said. Highland Park quarterback Chandler Morris spoke to reporters while wearing an Arkansas backpack. Now, that makes sense when you consider his father is Arkansas head coach Chad Morris. But the 5-foot-10, 172-pound dual threat QB, who led the Scots to a state title last year and was an MVP of The Opening, has nine offers on the table, including the Razorbacks. But Big 12 schools Kansas and Oklahoma are in the mix. 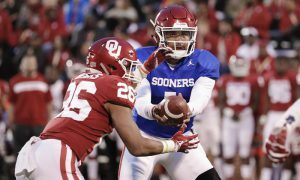 He said OU’s success with Baker Mayfield and Kyler Murray speaks for itself. And while he admits some schools seem reticent to speak to him — probably due to some believing that him going to Arkansas is a done deal — Morris said his father wants him to make the decision that is best for him.